Signed J. D. W.; inscribed on the mount, in another hand, The horrors of War. 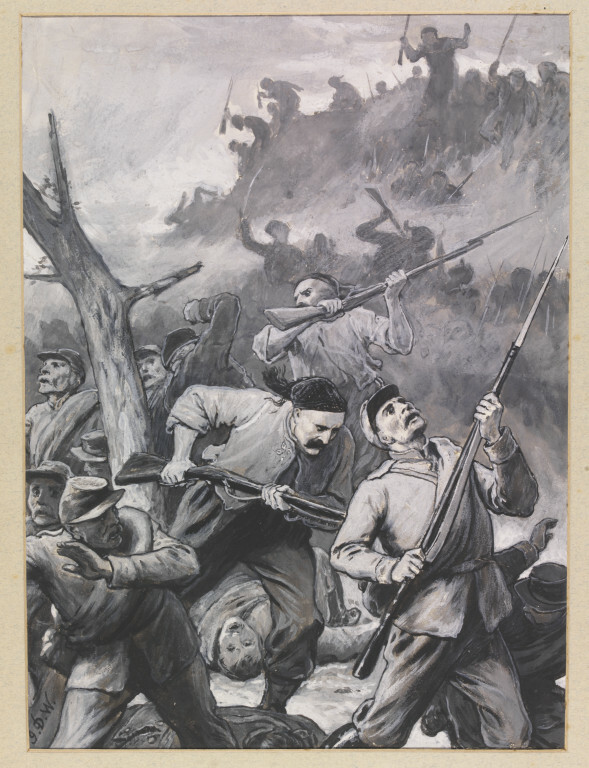 Sketch made during the Russo-Turkish War. Drawn by J.D. Watson. According to Rodney Searight: - `R. Appleby, Nov.1970, £4'. Reproduced in The Graphic, Vol.xvi, 13 October 1877, p.357. 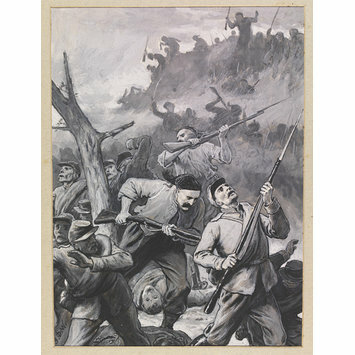 The drawing depicts an incident during the struggle in the Shipka Pass, August 1877, a battle of the Russo-Turkish War (described in The Graphic, 29 September 1877, pp.16, 20). The caption to the engraving of SD.1189 states that 'the impetuous charge of the Turkish soldier is well known. With visions of Paradise before him, if he falls while fighting the "unbeliever" he cares little for death, and with the battle-cry of "Allah! Allah!" will dauntlessly dash himself against the most serried ranks of breech-loaders'.